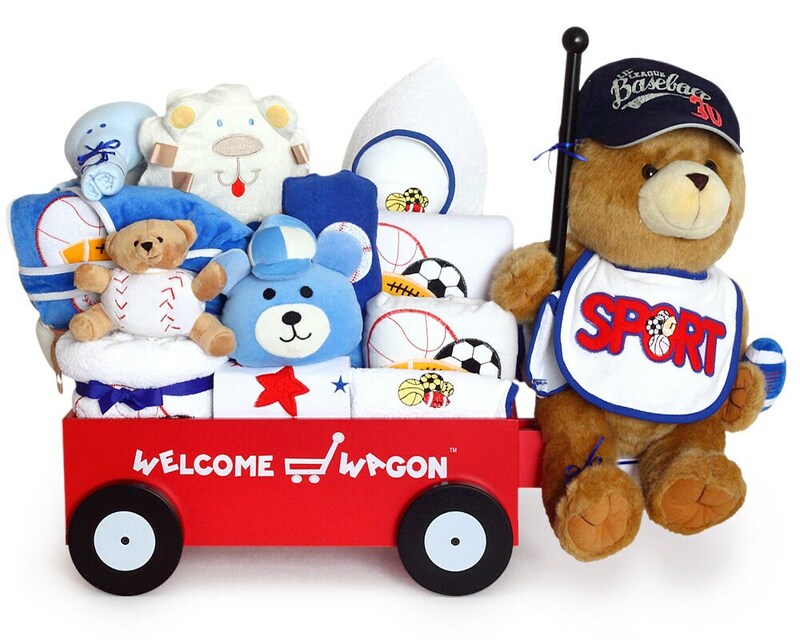 This Super Deluxe Welcome Wagon gift for baby boy has it all...a fabulous wagon pull-toy, a long list of quality layette items for baby, and a presentation that's simply off the charts impressive. The deluxe sized Welcome Wagon pull-toy is made of wood and comes meticulously finished in red with white & black accents. The wagon comes fully loaded with baby boutique quality layette and accessories for a newborn baby boy. The layette is proudly made in the USA from domestic cotton fabrics. A sports ball themed embroidery/applique design coordinates the gift for the new little slugger.